If you watched last night's City Council meeting, you saw a community grappling with tough issues: public safety funding challenges and sacrifices, redirecting citizen generosity, exploring policy gaps, tackling blight, and addressing social service benefits and needs. This discussion, though awkward and uncomfortable at times, is integral to maintaining a well-functioning community...and we've only just begun. Many audience members felt frustrated last night, others were cautiously optimistic. I imagine that everyone in the room probably felt a mix of both at one point or another. However, I look at the breadth of topics we covered during this Council study session on cleanliness and safety and I'm proud. We moved fairly seamlessly from public safety to policy to infrastructure to engagement without a hitch, demonstrating the true interconnectivity of the key pieces of the puzzle. Many of Council's decisions were building blocks to next steps, such as the decision to return in 8 weeks to look more deeply into the financial and political implications of immediate public safety relief in the downtown core and the ordinances that might serve as additional tools. Ultimately, we'd like to see a fully funded public safety team in place by December 31, 2013 to address needs throughout Chico. After all, our members identified public safety as our #1 advocacy priority in 2013...and we took this seriously. Our Clean & Safe Chico team, largely responsible for framing the topics around action, had some successes last night, too. We officially launched our generosity campaign to encourage giving to service providers rather than to panhandlers which, studies show, delays individuals from seeking help and attracts panhandlers to our community. Please, pick up a poster at the Chamber to share this message with your clients, customers, families, and friends. On that note, I encourage you to find your niche within this ongoing mountain-moving endeavor. Opportunities exist that accommodate every set of beliefs within the framework of our solution-based Clean & Safe Chico model: mentoring, volunteerism, campaign messaging, policy advocacy, etc. If you need help now, please let me know so that I can communicate your concerns to our City Council. Or, please get in touch with our decision makers directly. If you want to help but you're not sure where or how, we will connect you to the project that will help you make the changes you most want to see. 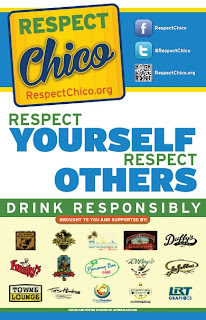 Because these conversations don't stop at the end of the workday, we're all over facebook and twitter: Chico Chamber, Clean and Safe Chico, Respect Chico. Find us, follow us, and chime in. 1. Following our Clean & Safe presentation on March 5th, the Chico City Council decided to dedicate their entire March 26th meeting to concerns about cleanliness and safety and what we can do right now to deliver thoughtful and effective solutions. What’s on the agenda: generosity campaign, Plaza programming, law enforcement, goodwill ambassadors, and other key initiatives. Stay tuned for details on this important City Council study session and make plans to tune in. Concerned that we’re only focusing on downtown Chico? I assure you we’re looking at this from a community-wide perspective. But, we’re confident that a few successes in the downtown are on the horizon. 2. 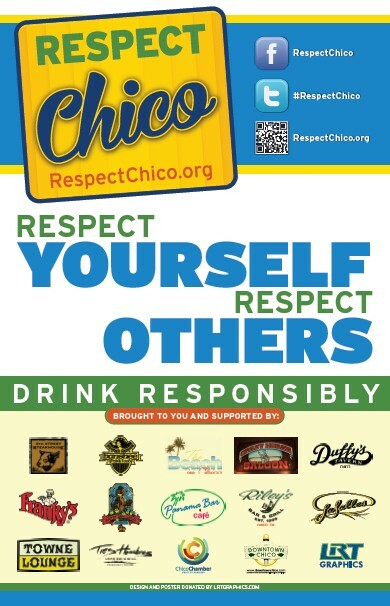 Several bar and restaurant owners have been getting together following CSUC’s Community Call for Action to ask “what can we do?” Believe it or not, with the help of LRT Graphics, they’ve already launched a “Respect Chico” campaign aimed to encourage customers (yes, students) to respect themselves, respect others, respect their community and, bottom line, drink responsibly: respectchico.org. They planned to roll out their ads and posters in time for St . Patrick’s Day and, well, they’ve done it! Look in the Synthesis and CN&R this week for a glimpse of their message, and look for posters in their businesses by the end of today -- thank you LRT! Want to join the conversation and/or support the cause? Let me know. 3. The Chico Chico Retail Market Analysis, sponsored by Tri Counties Bank, is now underway following an Advisory committee kickoff meeting this week. We’re planning three focus sessions to capture your thoughts, experiences, and guidance. We need your input to generate results that will be applicable to retail success for years to come. Two focus sessions are set for April 9th -- at the Mall (3:30-4:30pm) and the downtown branch of TCBK (5:30-6:30pm) -- and a third session at Holiday Inn on April 10th from 3:30-4:30pm. Pick the date/time/location that works best for you and watch your inbox for an invitation! 4. The City of Chico continues to improve their permitting process based upon feedback given at our workshop in early December. Click here to see what’s been done and keep your input coming! There is so much to be done. Let’s hang in there, stay connected, and keep up the good work!